Don’t look now, but Christmas is coming up quickly. Are you ready? Here at the Grubbs house we like to think we are ready. The annual Christmas chili and donuts (our tradition) ingredients are ready and the presents are wrapped and under the tree. We are off the pickleball traveling trail for a few weeks and are gearing up for a fun, fun 2017. If you have a little last minute Christmas shopping to do, we thought we’d offer you an investment that will make those final purchases a little easier on your wallet. 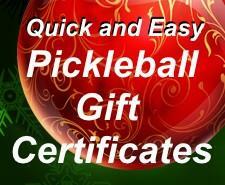 Buy any Gift Certificate at PickleballShopping.com and we will increase it automatically by a whopping 20%. Yes, an instant 20% return on your money. So if you buy a $50 Gift Certificate, you will receive a free $10 increase, thus a $60 Certificate. Buy a $100 Gift Certificate and receive a $120 Certificate. Yes, $20 extra for FREE. Now that is what we call a great investment. If you don’t see the denomination you are interested in, just drop us a line at PlayerServices@AllAboutPickleball.com and we’ll make it happen for you. You will receive your Gift Certificate via email within a few hours of your purchase. is only good through Midnight December 23rd. blog post will make you rich. However, it will make someone very happy. Andy Roddick Versus Kyle Yates in a Pickleball Match? Now that I have your attention. Yep this really happened, and the world is now a better place because of it. On Wednesday November 30th, the sports of tennis and pickleball came together to benefit the Andy Roddick Foundation. The scene was the Austin Tennis and Pickleball Center in Austin Texas. Tennis legend, Andy Roddick came out to learn and play pickleball along with long-time tennis professional Amer Delic. Joining them on court? Pickleball pros Scott Moore and Kyle Yates. What a great men’s doubles match. To top the evening off Andy and Amer played a mixed doubles match with Terry Harper and USAPA Board Member and Christine Barksdale. An enthusiastic crowd turned out for the fun and fundraising. What a great night for pickleball. We are so thankful that today’s technology allows the capture of so many fantastic points, games and matches from the great sport of pickleball. Below are some of our favorites, shared by our pickleball friends. ENJOY! 11 Jaw Dropping Points from Matt Staub and Daniel Moore vs Kyle Yates and Wesley Gabrielson.